Katherine won the last drawing! And I’m desperate to try the black cherry soda. Today’s question is at the bottom of this post. Makeover time! I’ve written many a page in my trusty old puff rocker, but it needed a makeover. 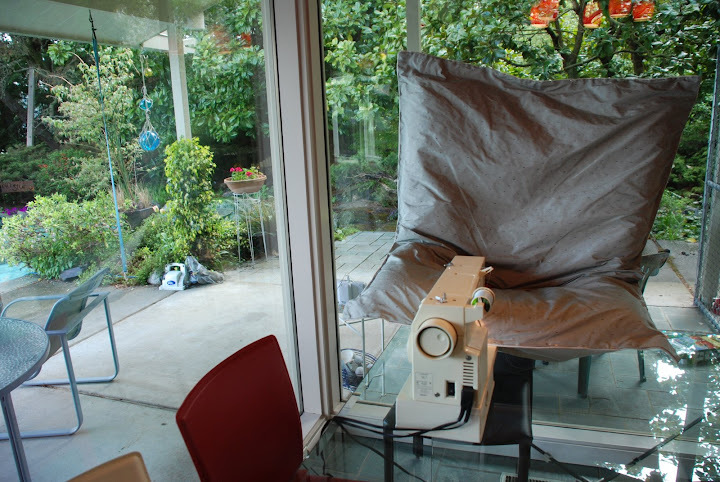 So I dragged out my trusty rotary auction sewing machine and got to work. It was kind of awkward to sew. ...but at least I had a nice view. And here is the result. Barkis gives it a paws-up! The next drawing is for a copy of a terrific new book–Blood Bayou by the lovely and talented Karen Young. I bought a copy, and then Karen was nice enough to send me one, so I have an extra! And of course, a signed copy of Just Breathe. Today’s question–what gives you “happy hands?” Do you have a favorite craft? (even if you don’t practice it!) Post in Comments below, and you’re entered. Hmmmm…I’m not so crafty, but I’m a chef! And I love to bake! Frosting rich, chocolatey cupcakes with a pale pink buttercream icing into fat, fluffy swirls has to bring the most satisfaction. And then there’s knitting…still working on my first project! I dropped a stitch and I still can’t figure out how to pick it back up! 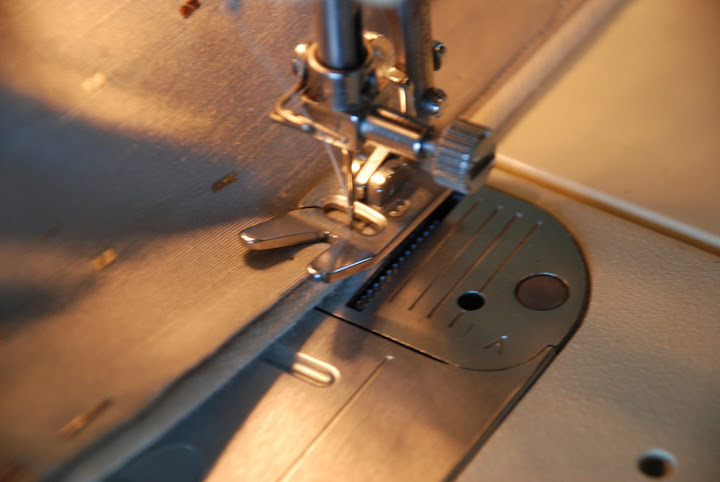 Happy hands – used to be sewing, now it is mending. Tried knitting, never finished it. Loved painting… recently purchased all new paints, brushes, etc…. back to painting and writing. Totally agree with MJ, like to feel the earth when I am gardening. I have found some best gardening gloves, so now I wear gloves. Perhaps, it is the creative process – making something from a few ingredients or watching the garden grow into a mass of blooms or a wonderful piece of fabric into a chair cover, etc with your own two hands giving such a sense of satisfaction and contentment. Enjoy the day. I have happy hands when I’m gardening. I NEVER wear gloves. I love feeling the warm dirt on my hands!! I’m not very crafty except when it comes to thinking up projects for my kindergarten class! Wow, ok Susan I am jealous!!! I can’t sow worth a lick. In fact, I break out in a cold sweat just looking at your handy work!!! Amazing job by the way. My hobby-after reading and writing :)- is digital scrapbooking. With four kids, I need something that’s easy to clean up and what better than digital paper and glue. I can even add digital glitter! COOL BEANS! Thanks for the chance to win such a great gift! My favorite “craft” is photography. Does that qualify as a craft? I also really like to bake. I am not crafty at all. But if I was to do something crafty it would most likely be making centre pieces. Maybe I will start that as a new hobby and be good enough to sell a few. I have tried to croche and knit, but it was not my thing. I tried needle point too. I just don’t have the patience. The best thing for me to do with leisure time is have a book in my hand. But bravo to all you crafty people. You make things for people like me to buy at craft sales. happy hands…..well, the thing that gives me happy hands has to be typing. i consider this a craft, because, if done well, a masterpiece is born. i love words and the different things that you can do with them, but i have never been satisfied with my handwriting. with that being said, i love to type. i do it a lot faster than i write and i think that it classifies as a craft!!!! P. S. I loved Elizabeth’s post! Your chair turned out beautiful. 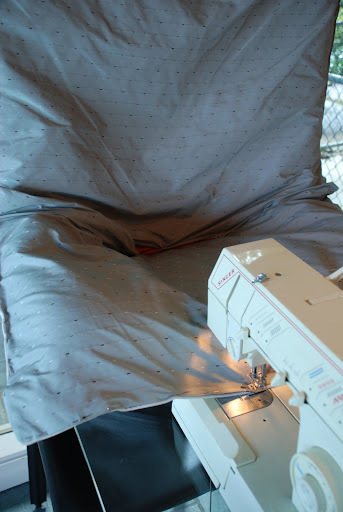 I used to sew some, made knit t-shirts for my boys when they were small, but I never attempted to re-do a chair. Your house is just awesome–the windows!! The crafts I like to do are making greeting cards with all the lovely papers and rubber stamps. I may try a scrapbook of our recent vacation. I also like to do embroidery work, right now I am working on a set of tea towels (cats) for my daughter-in-law and a Christmas cross stitch towel set for a friend’s birthday (snowmen). I collect old embroidered linens–dresser sets, hankies, aprons, etc. Hi Susan, I love how the chair turn out. It looks really comfy. Growing up I did some needlepoint and crocheting. I still do both, but not as much as I used to, especially since moving. I also use to make dreamcatchers. I enjoy making the dreamcatchers, each one is difference everytime I would create one. My family members and friends enjoyed the ones that I gave them. Since moving all of my craft supplies are in another state at my mothers house in storage, but I wish I had them with me. I prefer crocheting. But don’t ask me to do anything complicated – I’m still learning! (I can make a scarf and a chicken.) I usually end up playing with yard when my brain starts shutting down after a large amount of stress. One summer when I took 15 hours of classes put me into a six week spree of crocheting at the start of the fall semester. I kept making the same scarf over and over… and didn’t get any studying done. I did end up with an ten foot scarf that would put Doctor Who into a fit of jealousy, I suppose. I used to knit; then we moved to Florida, and it’s just too hot. I took up needlepoint, but ran out of room on my walls (and there’s still the hot, sweaty hands factor). So I started writing, which isn’t the same kind of craft, but it gave me a much needed creativity outlet. When we move, we’re going someplace colder, so maybe I’ll get back to a hand crafting hobby. The chair looks fantastic! The photos left me very envious of both your garden and your dog – what a good-looking creature! I’ve recently moved into an oversized cupboard in central London, so I really miss my cats and the greenery. I always wished I was better with my hands, they’re very small and quite stumpy, so I can never quite managed to make such wonderful things with them. I do draw, although I’ve fallen out of the habit since moving out of home, because my new residence isn’t big enough to stock art materials!! I now get my creative kick out of writing. I like best to write out my poetry in a beautiful foutain pen in a small moleskin notebook a friend gave me for my birthday. I’d like to think that counts as a kind of craft – and it certainly makes both me and my hands very happy!